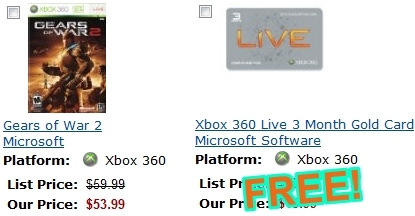 Just thought you'd like to know that the always deal plentiful Amazon.com is offering a free 3 month Xbox Live subscription card with purchase of a $53.99 copy of Gears of War 2. That's a retail savings of about $20. This Gears 2 and free Xbox Live bundle offer is valid through January 13th, so be sure to decide on a purchase within' the next week or so. 3 months of Xbox Live free with Gears 2 purchase originally appeared on Xbox 360 Fanboy on Mon, 05 Jan 2009 10:00:00 EST. Please see our terms for use of feeds.